John N. Tillman was the first graduate of the university to serve as its president. He was educated in the public schools of Washington County and graduated from Arkansas Industrial University in 1880 with a Bachelor of Latin Letters. He taught in the public schools of Arkansas for three years, studying law at the same time. He was admitted to the Arkansas Bar in 1883 and was elected circuit clerk in 1884. He was elected prosecuting attorney and later appointed circuit judge of the 4th Judicial District. In 1905, Gov. 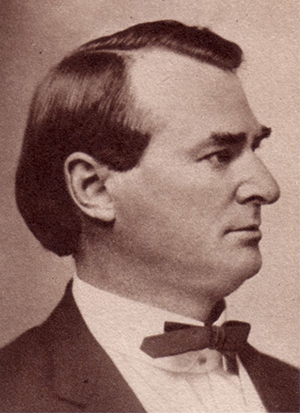 Jeff Davis supported the election of Tillman as president of the University of Arkansas, in part due to the governor’s own political ambitions and a desire to have political allies in positions of authority. Tillman, though, had been very involved in the university’s needs, serving as president of the alumni association, helping repeal state laws that had hampered development of higher education, and serving on the Board of Trustees. As president, Tillman helped organize the College of Agriculture, raised entrance requirements and oversaw a large increase in the number of students enrolling at the university. He also fought back attempts to move the university from Fayetteville to Little Rock. Near the end of his tenure, though, a student revolt resulted in the expulsion of 36 students, many from leading families. Gov. George Donaghey brokered a deal to settle the matter, and Tillman resigned at the end of the school year. He was elected to Congress two years later and served seven terms. Personal: Tillman was born near Springfield, Mo., on Dec. 13, 1859. He married Temple Walker, and they had three children. He died at Fayetteville on March 29, 1929, and is buried at Evergreen Cemetery.